Hello there, today I have another Clearly Besotted teaser to share with you. Today I am using the adorable Be Lucky stamp set. Oh my word! It is so sweet! It is filled with adorable little critters and wonderful encouraging sentiments. I started off by stamping the unicorn and rainbow from the set with black ink on some white cardstock. These were coloured with Copic Markers (as always, the colours used are listed below the supplies). I did the first part of the rainbow colouring on the actual rainbow and then the rest of the colours on the unicorn. These were then fussy cut out using scissors. I then took the LF Stitched Journaling card die and cut this from white cardstock and also watercolour cardstock. With the white piece, I further cut this using the LF Puffy Cloud Border dies. I took the watercolour paper piece and added some colour to it using Distress Inks in Tumbled Glass and Peacock Feathers. These were watered down and then painted on with a paintbrush. 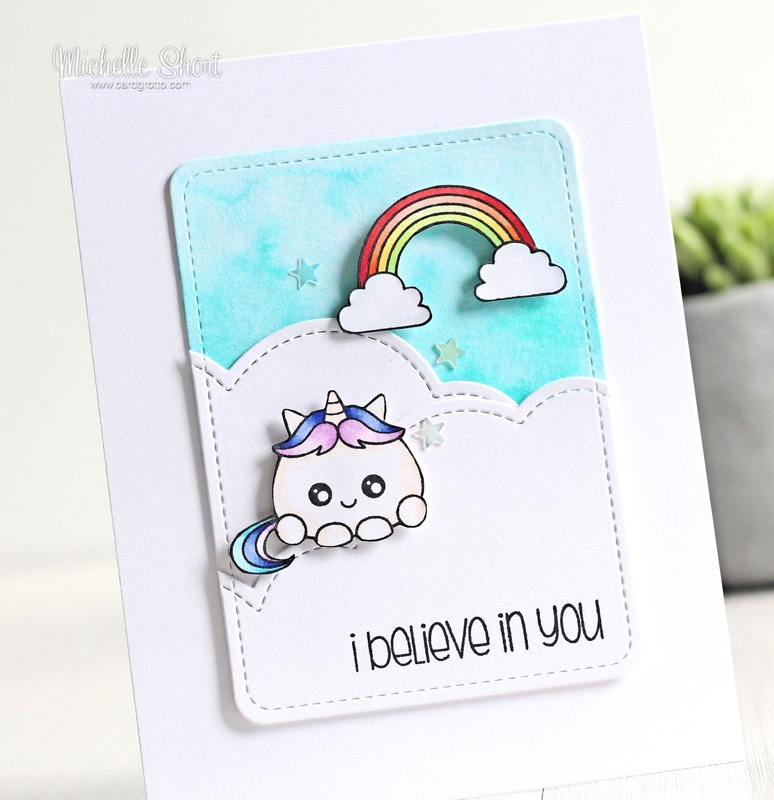 I stamped the sentiment on to the bottom cloud and then layered the panels to make a background for the unicorn. 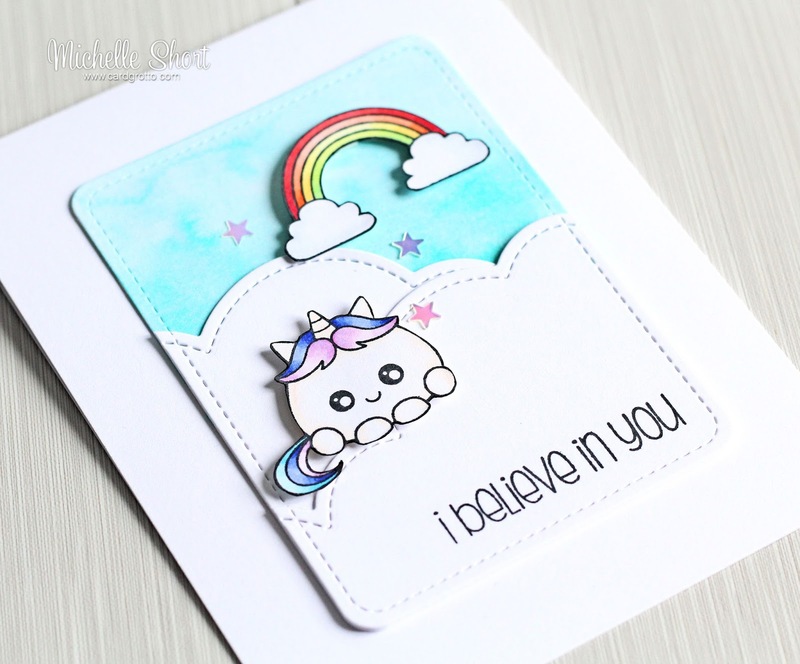 I added the unicorn and rainbow with foam tape and then added the panel to a white A2 card base. To finish off, Of course I added Wink of Stella as what unicorn would be complete without a bit of sparkle! Here are the links to what I have used on the card. Please click on the picture or wording to be taken to where I purchased it. Affiliate links are used on some products. This means that if you make a purchase after clicking on my link, I receive a small commission with no extra cost to you. I truly appreciate your support when using these links. The new Clearly Besotted products will be added upon release. COPIC MARKERS: Unicorn: E50. Blues - B04, B02, B00. Indigos - B69, B66, B63. Violets - V05, V01, V00. Rainbow: Reds - R29, R27, R24. Oranges - YR68, YR65, YR61. Yellows - Y15, Y13, Y11. Greens - YG06, YG05, YG01. I thought this would make a nice little encouragement card for someone. As always, please give Stephanie a visit. She will have some amazing tears to share, along with links to the rest of the DT sharing today. Thanks so much for visiting me today, see you tomorrow! Aw Michelle this is SOooo sweet! I love it.